Is a grayish silver in color and non magnetic. Aluminium is a versatile metal with a multitude of applications, aerospace and automotive being the two main industries. Aluminium is also a good conductor of heat and electricity at about 60% of copper. It is light, durable and of low density making it an excellent alternative to steel in truck bodies and framing. UBC or used beverage cans must be aluminum and must come in clear plastic. Cans brought in opaque plastic bags will be purchased at a lower rate. Cast aluminium is cast in a mold to make different forms. It is usually a mix of many diferent series of aluminium and as a rule must contain less than 2% iron and be free of all other contaminants, e.g., zinc. Irony aluminium is aluminium with a steel content above 5%. 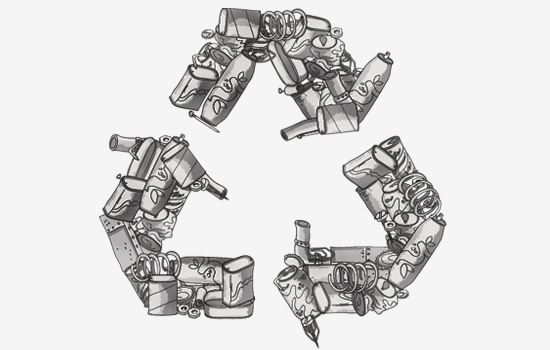 Mixed Irony Aluminum shall consist of assorted scrap aluminum contaminated with Iron, the aluminum content must be a minimum 70% and iron may not exceed 30%. Must be free of excessive plastics, oils and other materials prohibitive in the sweat furnace operation. Litho is used in the printing industry. It should be free of contaminants and have the paper removed. Mixed Low Copper is a clean bare mix of 1000, 3000, 5000, and 6000 series aluminium. It must be free of paint, plastic and all other contaminants. Aluminium Radiators from vehicles. Come clean or with steel and/or plastic. Aluminium machine turnings must be free of lubricant or cutting oil (a milky white liquid). The rim is the “outer edge of a wheel from a truck, holding the tire”. It makes up the outer circular design of the wheel on which the inside edge of the tire is mounted on vehicles and made with Aluminum. All rims must have the tires removed. Old sheet aluminium is unclean aluminium. It may contain small ammounts of steel (screws, rivets, nails, zinc, plastic, or rubber. It should also be free of glass. Teflon coated pots and pans are also considered old sheet. Painted aluminium is flat or rolled aluminium. It is usually used for siding and eavestrough. Aluminium rims from cars. Regular, chrome, and chrome clad rims. All rims must have the tires removed. ACSR is aluminium wire with a steel reinforced core. May come with or without insulation. Manufacturing process in which a softened blank of a metal or plastic material is forced through a shaped metal piece or die to produce a continuous ribbon of the formed product.